The International Monetary Fund is back issuing warnings about the global economy and investors best heed those warnings. The IMF may be controversial in many ways, but when it comes to the individual investor’s perspective, they don’t really have an axe to grind. 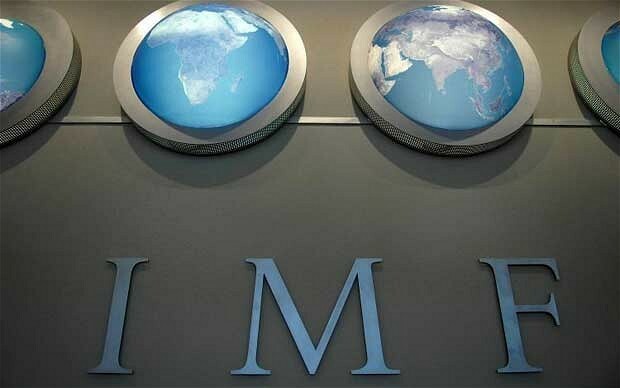 The IMF cut its global growth forecasts as the euro area’s debt crisis intensifies. This comes as a bit of a shock to many observers since the European crisis has been pushed to the back burner by the US presidential election and Middle East issues. This is a stark warning that Europe is still sick and not in recovery. What all this means to investors is that the global economy is fragile and when the economy is fragile, the financial markets are under duress as well. That requires action, specifically acquiring investment assets that can provide a hedge against turmoil. Hard assets, particularly gold investments, are ideally suited for that purpose. And when it comes to gold investments, rare gold coins offer a unique combination of performance and security benefits. After the Fed’s latest zero-rate promise pushed gold back to the financial front pages, it’s worth asking who’s buying in bulk, and why? There’s plenty of noise, for instance, about Chinese households buying gold during last week’s New Year holidays. Away from the massed decisions of private investors and savers, gold holdings amongst the world’s central banks have quietly risen to a six-year high, according to data compiled by the International Monetary Fund. A good chunk of this weaving is due to official reserves. As our chart shows, central banks control a shrinking proportion of what’s been mined from the ground. A far greater tonnage of gold again is finding its way into private ownership, and it’s having a greater still impact on how money and finance work. First, private individuals have led the rediscovery of gold bullion as a financial asset, rather than the decorative store-of-value it had become by the close of the 20th century. Institutional finance has caught up, however, and gold is now in front of the Basel Committee on global banking, proposed as a “core asset” for banks to hold and count as a Tier 1 holding for their liquidity requirements. Turkey’s regulators already acknowledged physical gold as a Tier 1 asset for its commercial banks starting in November, with the cap of 10% worth some 5.5 billion lira ($2.9bn) according to Dow Jones. Also, a growing number of investment exchanges, meantime, as well as prime brokers, now accept gold as collateral, posted as downpayment by institutions against their commodity and other leveraged positions. Just on Friday, London market-maker Deutsche Bank was added to the CME’s list of approved gold custodians. Gold pays no interest of course. But in our zero-yielding world, that only puts it ahead of where the capital markets are being herded by central-bank policy anyway. Nor does gold have much industrial use (some 11% of global demand in the 5 years to 2011), a fact which highlights its unique “store of value” attributes. Being physical property, gold is no one else’s debt to repay or default. Being globally traded, it’s deeply liquid and instantly priced. Turnover in London’s bullion market, center of the world’s gold trade, is greater at $240 billlion per day than all but the four most heavily traded currency pairs worldwide. And being both rare and indestructible, it couldn’t be any less like “money” today. Scarcely a lifetime ago, gold underpinned the globe’s entire monetary system. 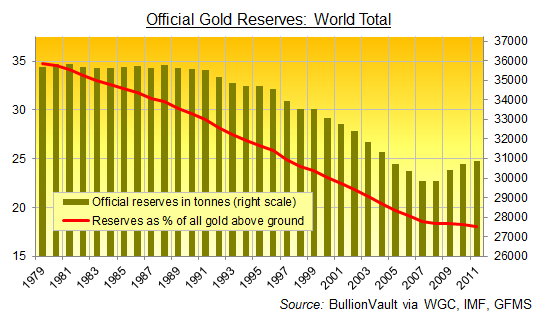 Outside China, which tried sticking with silver, the compromised and then bastardized gold standard which followed first World War I and then World War II still saw the value of central-bank gold reserves vastly outweigh the paper obligations which those banks gave to each other. Even three decades ago, 10 years after the collapse of what passed for a gold standard post-war, central-bank gold holdings still totaled some three times central-bank money reserves by value. Look at the decade just gone – the 10 years in which gold investment beat every other store of value hands down. Pretty much every currency you can name lost 85% of its value in gold. Yet the sheer quantity of new money pouring into central-bank vaults saw their gold holdings only just hold their ground. Gold’s rise, in short, has been buried under wood-pulp. To recover its share of central-bank holdings as recently as 1995 would now require a further doubling in value. To get back to the 1980s average would require a 15-fold increase. 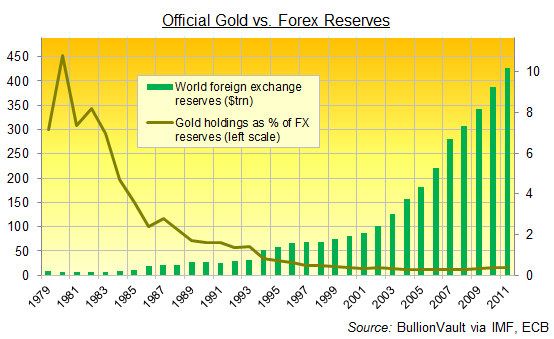 Or, alternatively, a 93% drop in the value of foreign currency reserves relative to central-bank bullion holdings. Coggan rightly notes that China isn’t the only large creditor, and nor does it hold anything like the dominance which the U.S. held at the end of World War II. Whether this switch starts today or only starts to show 10 years from now, the risk of such a change of direction can hardly be discounted to zero. Repudiation of government debt, the form which most foreign currency reserves take, will only begin with the Greek bond agreement, perhaps leading first to a rise in U.S. dollar holdings but also highlighting the ultimate risk of holding paper promises. And that fear, of having to write off money thanks to default or devaluation, is clearly driving the rise in gold demand from central banks already.